Frank Kitchener farmed at ‘The Bury’ in Northampton Road. The following account is believed to have been written in the 1960s. It describes Frank’s early memories of Lavendon village and the folk who lived there. A pencil note on the original states that the following account was reproduced in “Lavendon Life” in April 1998. Lavendon, an ancient Saxon village once known as Lauuendene is situated in the northern tip of Buckinghamshire flanked on either side by Bedfordshire and Northamptonshire. The population over the last eighty years has grown from some five hundred inhabitants to its present figure of approximately one thousand. 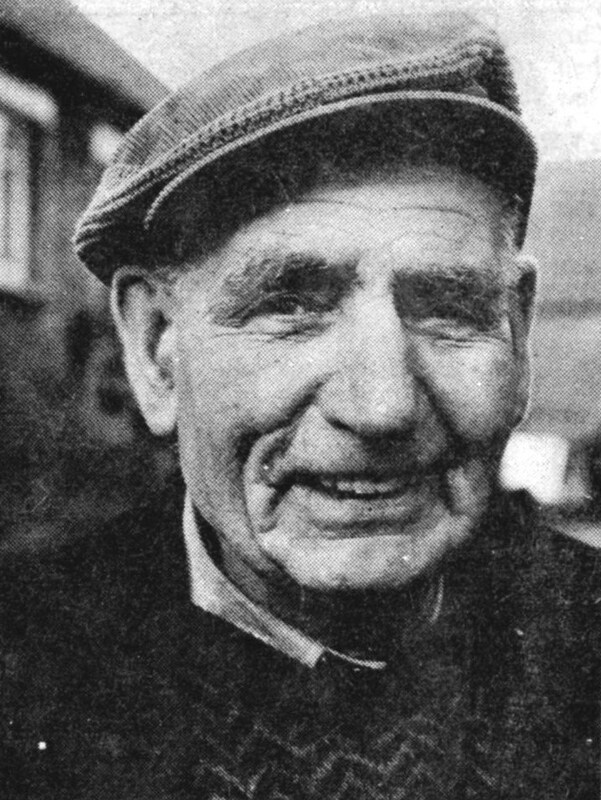 Although times were hard people were happy as is shown by the following account given by a gentleman, Frank Kitchener, who has lived in the village all of his life, as did his father before him. During the 1920’s and 30’s, Lavendon’s population was about six hundred. It boasted eight fairly big shops which sold everything from groceries to clothes, a Co-op, three small sweet shops and a motor-bike and cycle shop. It had two bakeries which delivered bread daily by horse and cart and cooked people’s Sunday lunches if required. Lavendon also had two shoemakers, and a small factory which employed some twenty to thirty people making shoe heels. These were taken to Northampton and Kettering by horse and cart three times a week to be sold. Since many people in the village owned horses and carts, Lavendon had its own blacksmith and wheelwright. A bus service ran between Lavendon and Northampton once in the morning and once in the afternoon. This bus was an open topped double decker with slatted seats and solid tyres! A carrier would also make the same journey by horse and cart delivering parcels. There were two building firms, two butchers, one or two good thatchers and a barber. A dentist visited the village once a week, so people’s needs were well catered for. In fact, in those days, Lavendon possessed most of the essential amenities. Most people kept hens, ducks and pigs, and one of the shops sold corn and flour. A lot of the men of the village worked on farms, others worked in factories in Olney or Northampton and some worked in Rushden. They would walk there on a Monday morning and return home again the following Saturday. Wages in the factories were about 17/- [85 new pence] a week, wages on the farm were a little lower, about 14/- [70 new pence] a week. A horse keeper would receive the highest wage – about 25/- [£1.25] a week but this involved longer hours and starting work at 4.30 am. There were a lot of large families in and around the village, making the school rather overcrowded. Those children who lived outside the village had to walk to school, and if they were late, they were given ‘a good telling off’. Lavendon had a lamp lighter (as did most villages). He would go round the village during the day carrying a short ladder and a can of oil to fill up the lamps and again at dusk to light the lamps. Finally at 10.30 pm he would dowse those which the young lads of the village had not already extinguished. The state of the roads was not good, and every so often the county council would send a steam roller to roll down the stones. However it didn’t take long for the horses to loosen them again. Lavendon had no sewerage plant until the early sixties, so toilets in those days were at the top of the garden and consisted of either a pit officially known as an ‘earth closet’, or a bucket with a seat. Since these had to be emptied by hand, the county council tendered for a ‘Night Soil Collector’ whose job it was to go round the village at night. His vehicle was a large horse drawn iron tank with iron wheels, which ensured that people’s rest was disturbed on collection night. As time went on vans with pneumatic tyres and Ford T model cars gradually replaced the horse and cart. The coming of gas and electricity greatly improved people’s lives. The years have rolled by and Lavendon has now become a much bigger village with three modern housing estates, and a very busy road which bisects the village. This road carries thousands of lorries and cars daily. A nice new school has replaced the old one although the original is still used for the playgroup. Lavendon now has two excellent public houses instead of three, and a lovely village hall which is the envy of all, and where a variety of activities take place ranging from theatre to private functions. The standard of housing has greatly improved and an adequate bus service provides transport to all the neighbouring towns. However there are now only two shops (one the post office) and saddest of all the craftsmen have disappeared. However Lavendon is a wonderful place to live, best of all the community village spirit engendered originally by mutual poverty still lives on.